Singapore made global headlines for being the venue of choice for a historic meeting between US President Donald Trump and North Korea’s Kim Jong Un at an upcoming summit. However, the meeting fell through, with Trump confirming that the meeting would not be happening yesterday. While excited citizens in Singapore may feel disappointed by the developments (us over at the Marketing team included), one brand with a sense of humour – IKEA Singapore – took the chance to cheekily newsjack the situation. 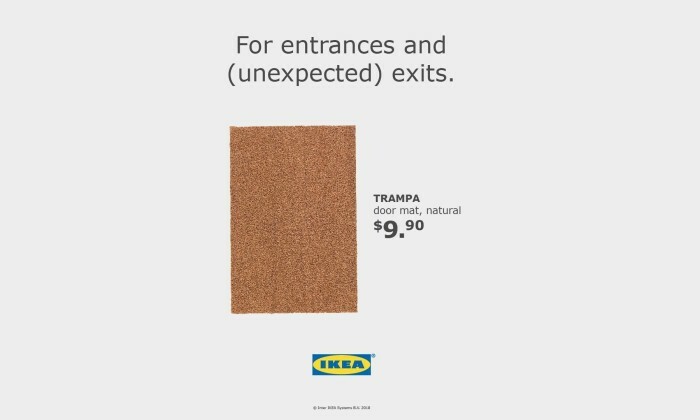 This saw the furniture giant posting a picture of its Trampa door mat with a witty tagline “For entrances and (unexpected exits)” which pays homage to the short-lived excitement over the North Korea summit. “We’ve always believed in connecting to our customers on current topics in a different way. The move to promote the Trampa was a humorous take on the news and our way of having some light-hearted fun on a serious topic,” an IKEA spokesperson said in a statement to Marketing. In 2016, the furniture giant took advantage of sensational remarks made by Josephine Teo, senior minister of state for finance and transport, during an interview with The Straits Times. It published a GIF image showing a cabinet, wardrobe, chair and stool shaking or vibrating, with the headline “The ‘very small space’ collection”. Meanwhile, on a more serious note, a spokesperson for the Ministry of Foreign Affairs Singapore expressed its regret over the cancelled summit between Trump and North Korea’s Kim. “Singapore regrets that the scheduled summit between President of the United States Donald J Trump and Democratic People’s Republic of Korea State Affairs Commission Chairman Kim Jong Un will no longer take place on 12 June 2018. Singapore hopes that the dialogue and efforts to find lasting peace and stability on the Korean Peninsula will continue,” the statement said. “We are deliberately using light hearted ways to engage with our consumers because this is exactly what the brand stands for – fun..
Prestige Hong Kong will celebrate its third anniversary next month by giving readers a whopping 808-page special issue, weighing i..